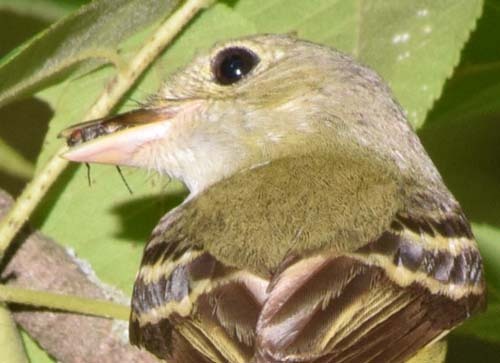 The Acadian flycatcher is said to require large tracts of forest for nesting habitat. But, in this case, the narrow wooded strip of land buffering cattail branch proved sufficient. However, the nest site itself was quite characteristic of this species. 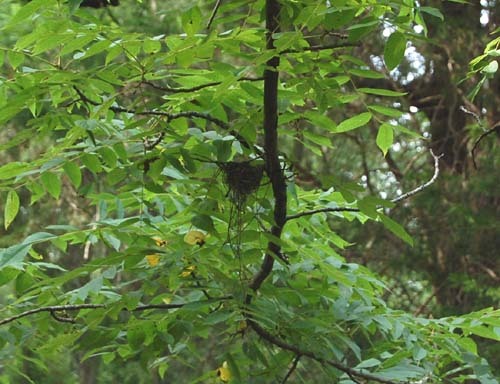 The nest was suspended from a fork in a low horizontal limb of a small tree, under the higher canopy of larger trees. It was positioned well out from the trunk and overhanging the creek. The nest appeared rather crudely constructed and included several long streamers of weed stems hanging down at least two feet. The nest was located beside a steep creek bank along which runs a rather overgrown and difficult foot path which I frequently traverse. Seeing the nest for the first time, I assumed, from its apparent condition, that it was old, perhaps from last year. But the nest was so obvious that I would not likely have missed seeing it if it had been there for some time. Perhaps it was a new nest, but had already been predated? The loosely constructed nest with these long streamers looked like neither, but those seemed the only options. Then, I noticed the two flycatchers higher up in the branches. That was another one of those small “Eureka” moments that nature often bestows on those who pay her even the slightest bit of attention. 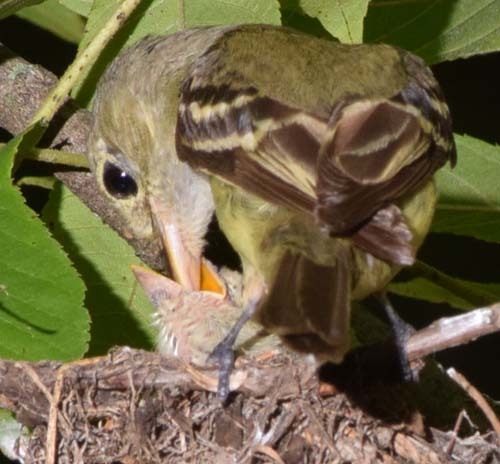 Several days later, I had erected a blind and spent some time watching the flycatchers at their nest. Perhaps due to the fact that I had stared at the nest so long, it finally dawned on me that this nest with its streamers very closely resembled hundreds of clumps of flood debris hanging from low branches, saplings and brambles on both sides of the creek. These consist of a mass of plant material about the size of a nest draped over the branch with streamers of grass or weed stems hanging down. A potential nest predator may draw this conclusion while I did not. 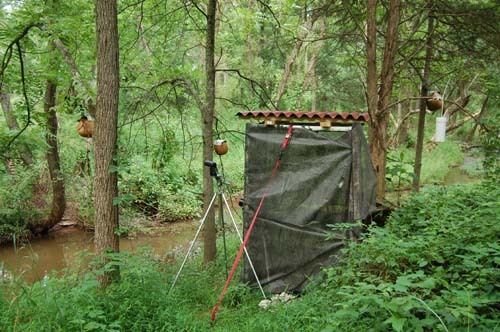 The predator’s more acute power of observation and less complicated mind would ignore what appeared to be flood debris. If it examined every bit of debris hanging from branches along the creek, it would starve. 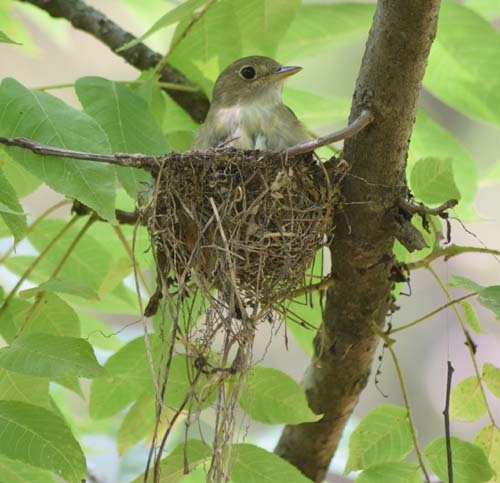 The human, on the other hand, might subconsciously not make a similar connection simply because the nest was well above any possible high water line. 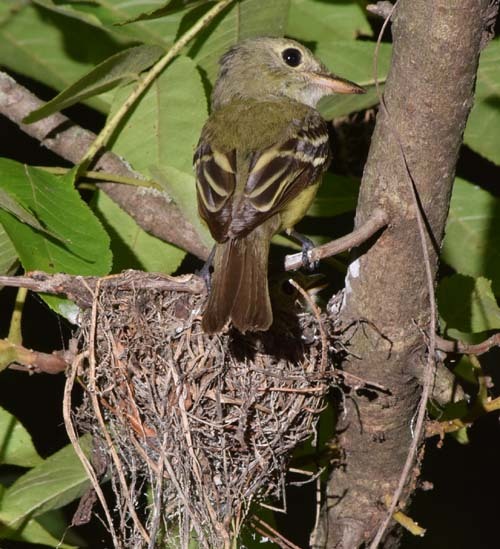 The evolutionary path to inclusion of these streamers in nest building would be fascinating to know. 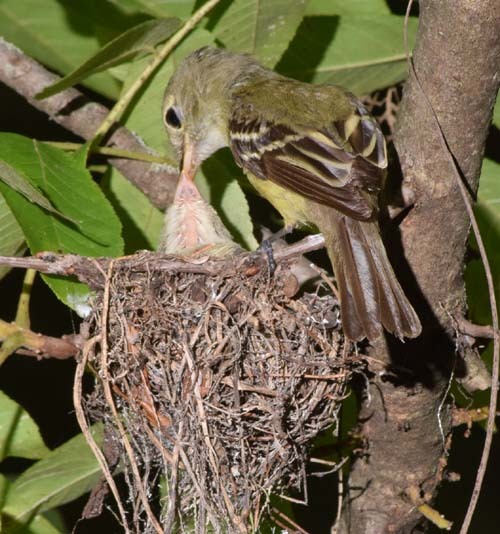 The fact that Acadian flycatchers frequently build nests over creeks, gullies and ravines suggests that hanging flood debris would be a common sight for them. Casual walks through a park or even scenic drives through the countryside are found by most to be relaxing. However, up close observation of any one of the multitudes of species to be found in even the smallest of wild spaces can be even more rewarding. Long ago, I realized that being away from nature for even a day was something between annoying and depressing. Luckily, I only had to live in town for any length of time during college. And, even then, I was able to frequently escape the university, thanks to the $75 purchase of a 1955 Chrysler. Later, after the military, I was also lucky to work at a small research lab funded by the NCI at the edge of a very small town. Even though I worked there for 10 years, it was only a short bike ride to the Monocacy river and a little further to Catoctin mountain. When I left the lab, my work for the next two decades required occasional trips to Washington area libraries and the patent office, but since then I have mostly led an urban-free life. Much has been written about “biophilia”, a term coined by Edward Wilson in his 1984 book of that name. While research suggests that the tendency toward biophilia is in our genes, I have many friends and acquaintances that seem to lack any fondness for or interest in nature. And, some of them even have a rural background. I wouldn’t think that hanging pastoral scenes on their walls would qualify them as biophiliacs. On the other hand, it is not necessary for someone to have an attraction to nature in order to want to protect it. President Obama seems not to share my attraction for Catoctin mountain since he rarely visits Camp David, yet he has done more to protect the environment than any president since Teddy Roosevelt. In contrast, Ronald Reagan and his Secretary of the Interior, James Watt were an environmental disaster, even though Reagan enjoyed playing on his ranch. As the world population grows more urbanized, will we find that biophilia requires a close association with nature during childhood? If so, the majority of the future generations will lack this experience. We tend to protect what we love – it’s that simple. 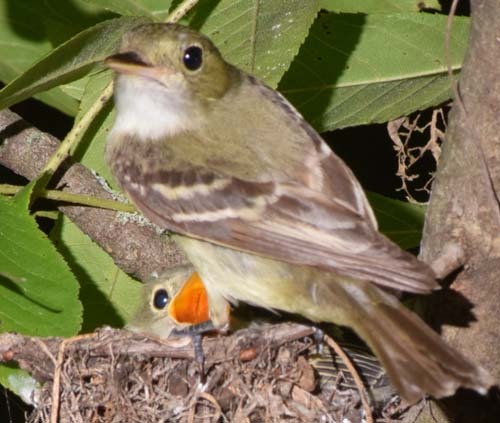 Both the nest construction and location are typical of the Acadian flycatcher. Due to its location, the nest contents could not be inspected. 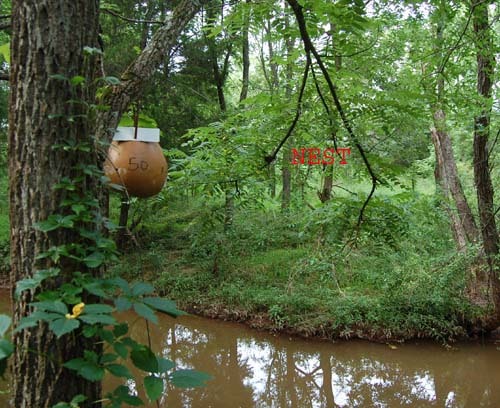 The nest was located in one of the house wren gourd sites, each of which had 3 small gourds and a pvc box. Wrens were nesting in a gourd close to the blind.